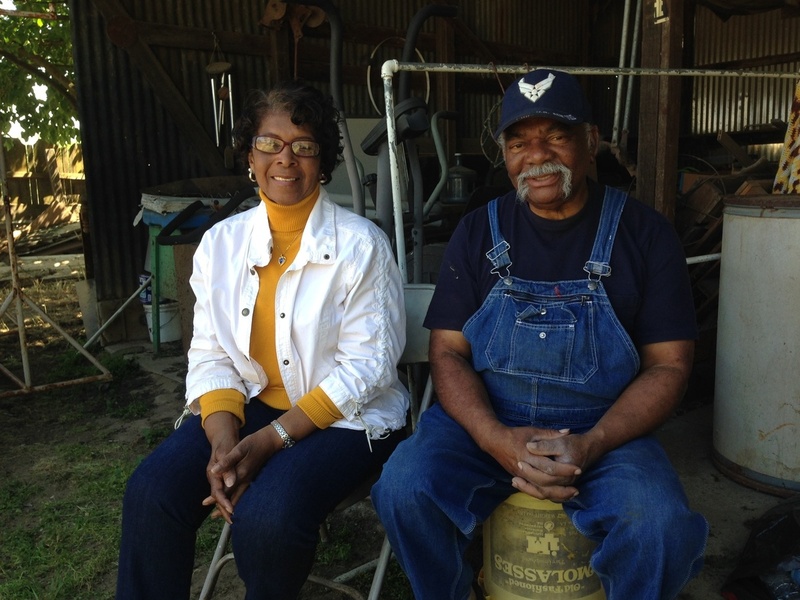 All Tapped Out In A Tiny California Town The years-long drought in California has taken a severe toll on the rural, mainly African-American community of Fairmead, where water drawn for agriculture has left wells dry. 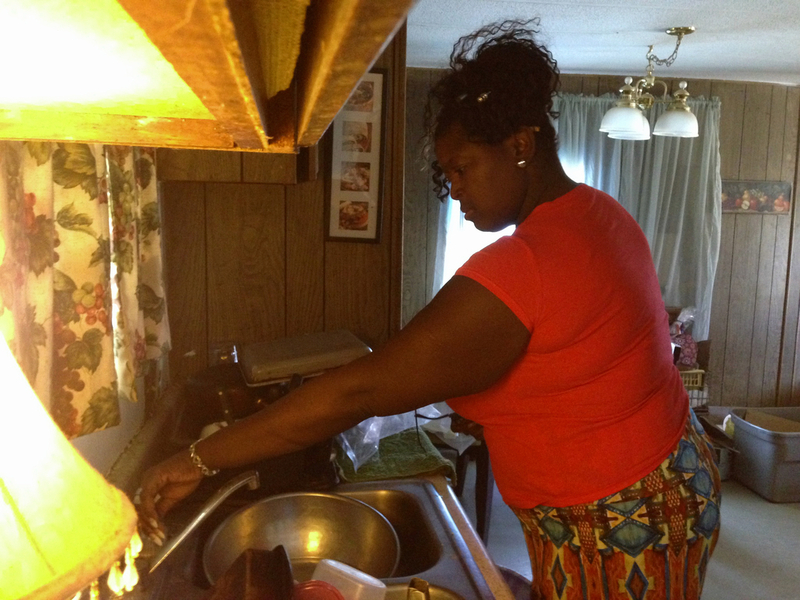 Thelma Williams' Fairmead home has been without running water for seven years. She showers at her parents' home nearby and fills up eight five-gallon jugs to bring home. Around the tiny rural community of Fairmead, Calif., about an hour north of Fresno on Highway 99, hundreds of one-story houses on small ranches stretch out for miles. The ground is mostly brown, parched by California's recent drought. But beneath the surface, this mostly African-American community in the San Joaquin Valley has been going dry for years. Fairmead used to be known for corn and cotton, but today the aging community is surrounded by large almond and pistachio orchards. Family homes in Fairmead with shallow private wells feet can't compete with agricultural wells sucking water out of the aquifer at 1,000 feet or deeper. Jean Wilson moved to Fairmead 20 years ago to escape big-city life. It wasn't until last year that her private well started shooting out sand. "I was the first one that actually went out of water," Wilson says. "I think about a year this month." Wilson got so fed up with the lack of government help that she wrote to Gov. Jerry Brown. "It's almost inhumane," she says she told him. "The biggest issue was, where can we go get water? You're telling me I can't have water. What are you saying?" When no aid came, Wilson created a flyer offering to deliver water to her neighbors. Annie Cooper and her husband found one of those flyers at a laundromat. Last June, their private well dried up when an almond farmer began drilling a well across the street from their country home. Annie and Lawyer Cooper, moved to Fairmead from Arkansas in the 1940s, have lived without running water in their home for almost a year. Cooper says she was fixing dinner one day that month when she called her husband to show him the trickle from the tap. "I said, 'There's hardly any coming out,' " she says. "The next hour so, that water was gone. We've been without it ever since." The Cooper family moved to Fairmead from Arkansas in the 1940s, like many other African Americans. They hoped to farm small plots instead of settling in cities like Los Angeles and Oakland. Thelma Williams moved to Fairmead in the 1990s from Southern California to retire on 40 acres of land. But life in Fairmead hasn't been easy: Williams has been without running water for seven years. She can't afford to dig a new well, so she showers at her parents' home nearby and fills up eight five-gallon jugs to bring home. For a while, the Madera County Farm Bureau provided drinking water to residents with dry wells, but that program has stopped. Now Madera County is working on a state-funded project to supply water to homeowners with dry wells. In time, qualified residents will receive a large tank for potable water that a truck service will fill every few weeks. The county plans to deliver bottled water as soon as state funding arrives, and plans to have the first tanks installed sometime in late May. But Wilson says the process is taking much to long. "Why do we have to go through so much of this?" she says. "Let all of them get their water cut off, everybody's water cut off for one month and have one station for everybody to go get water, and see what happens."